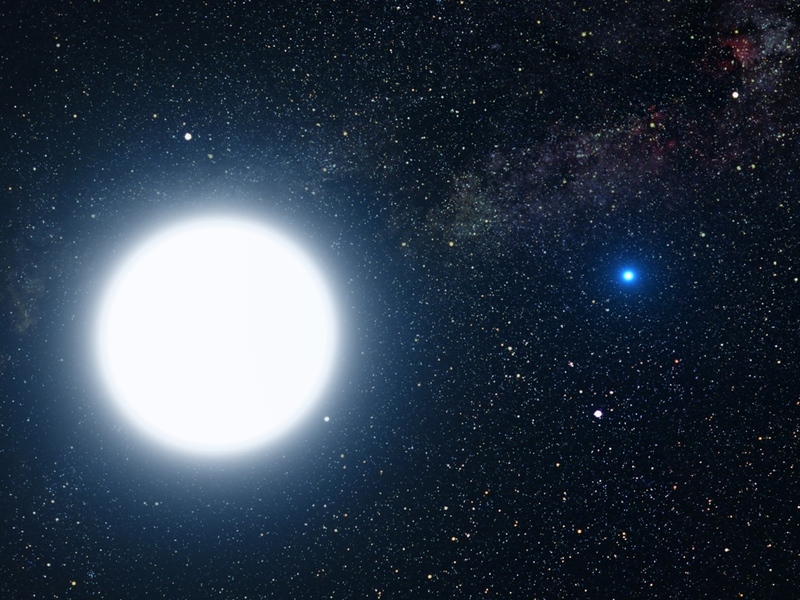 This picture is an artist’s impression showing how the binary star system of Sirius A and its diminutive blue companion, Sirius B, might appear to an interstellar visitor. The large, bluish-white star Sirius A dominates the scene, while Sirius B is the small but very hot and blue white-dwarf star on the right. The two stars revolve around each other every 50 years. White dwarfs are the leftover remnants of stars similar to our Sun. The Sirius system, only 8.6 light-years from Earth, is the fifth closest stellar system known. Sirius B is faint because of its tiny size. Its diameter is only 7,500 miles (about 12 thousand kilometres), slightly smaller than the size of our Earth. The Sirius system is so close to Earth that most of the familiar constellations would have nearly the same appearance as in our own sky. In this rendition, we see in the background the three bright stars that make up the Summer Triangle: Altair, Deneb, and Vega. Altair is the white dot above Sirius A; Deneb is the dot to the upper right; and Vega lies below Sirius B. But there is one unfamiliar addition to the constellations: our own Sun is the second-magnitude star, shown as a small dot just below and to the right of Sirius A.